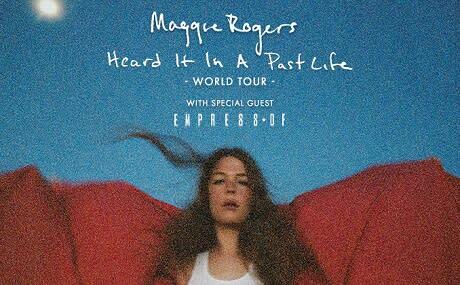 Maggie Rogers grew up in Easton, Maryland. After graduating from NYU’s Tisch School of the Arts, she released her critically acclaimed debut EP, Now That The Light Is Fading. The BBC, Tidal, Google Play, Vevo, Pandora and numerous publications – including Rolling Stone, NYLON, SPIN, Billboard and more – have tipped her as an artist to watch. NPR named her one of its Favorite Musicians and The New Yorker declares, “Maggie Rogers is an artist of her time.” Rogers’ television performances include Saturday Night Live, The Tonight Show Starring Jimmy Fallon, Late Night with Seth Meyers, and The Late Late Show with James Corden.